The more things you do, the more you can do. Have you ever noticed how hard it is to pass up temptation when it’s there all the time? Some of this problem is that once we decide that we’d really like that donut or mocha or french fry, it seems that they’re everywhere. So, we don’t have to pass up the temptation once. We have to keep making the same decision over and over. It’s the same as the phenomenon of deciding to buy a red Explorer and then seeing them everywhere you go. 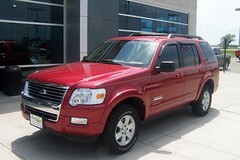 All of the sudden, everyone is driving a red Explorer. Our brain in on high alert for donuts and mochas and French fries and red Explorers. The same phenomenon is at work when we’re trying to make a change that requires exercising our will power. We’ve all tried to make a change for the better. We start the year off with a list of resolutions that seldom survive the entire month of January. And we blame ourselves for our lack of will power. We know that if we can just come up with a way to repeat the new behavior for 21 days that we’ll have it made. So, we try to will ourselves through that crucial 21 days in the hope that somehow that will make the difference. If we don’t succeed, we think it’s because our will power is defective. Actually, we just need to make it easier for us to succeed. The fact is that we all tend to take the path of least resistance. Whether it’s about going out and having a good time or practicing a musical instrument or eating healthy, our brain is going to choose what it perceives as the easiest path. That’s why when we perceive that there is no choice, we “just do it.” If we have to make choices, we can wear ourselves out before we even get started. The key to changing any habit is to design an alternative that is “easier” than the habit we have. At my previous job, I’d gone out to lunch every day. We were across the parking lot from a food court, so every day, with or without companions, I’d walk across the parking lot and choose from the offerings in the food court. Most of them weren’t particularly healthy, but they were easy. Where I work now, going out to lunch is a real pain. It takes 5 minutes to get to the car. Nothing is closer than another 10 minutes through traffic. Include the round trip and wherever I go better put the fast in fast food or I’m late getting back to work. As a result, I take my lunch. Actually, I take my lunch, several snacks, and my lunch. Because everything I take is decided the night before, the only temptations I face are those brought in by generous, well-meaning people. And, if I occasionally partake of a small piece of cake, it’s not that bad because I’m eating healthy 95% of the time. Are you trying to make a change? Design a simple, easy way to do the new thing. Do you want to read more? Carry a book with you (maybe on your smart phone, iPad, Nook or Kindle). Want to develop a gratitude practice? Put a little notebook in your pocket or purse and make short notes throughout the day – or use an electronic alternative that you carry with you anyway. Whatever change you want to create in your life, plan a simple way to do it. Uncomplicate it as much as possible. Reduce the startup time required to do the new thing and you won’t have time to make a decision. You’ll “just do it”!